What Is a Fitness Incentive? Nothing motivates someone more than knowing they get a reward for their accomplishments. Are you trying to start a wellness program at your office? Are you starting to feel like it’s an annoyance to your employees? Or maybe even coercion? You have the right idea, you just might be going about it the wrong way. You have to discover the right way to motivate your employees! Imagine the packed schedules of your employees, and then all of their duties outside of the workplace. Outside the office, many have families, volunteer opportunities, hobbies, pets, kids, passions, and more. So, when do they have time to exercise? There is a way to make time… but having the motivation to prioritize and pursue it can be challenging. This is where fitness incentives come in. What Is A Fitness Incentive & How Does It Work? A fitness incentive is a way of motivating and encouraging your employees to reach specific fitness goals. According to a study done by Gallup, they found a 79% success rate in achieving established goals when incentives were offered. Here at Wellworks For You, we know you already have a lot of decisions to make regarding your business and your employees. If you’d like to improve the health and wellness of your office, we are to here to help do all the legwork. All you have to do is provide your employees with an excellent fitness incentive. Using our Wellness Portal, employees have online access to their results and incentive progress. Whatever you do, don’t accept a one-size-fits-all program. Every company is different, even down to their wellness needs. Wellworks For You can discuss different options with you and help you discover the fitness incentive program that will work best for you. 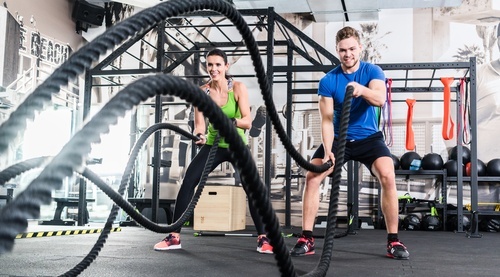 Your employees can work as a team and combine their fitness goals together. The team that reaches their goal first gets a monetary reward, a celebratory catered lunch, or maybe even new FitBits. The possibilities are endless. You can do this individually or as a team, awarding prizes based on the total number of pounds lost or the percentage of weight lost. Create an environment for your employees to compete against each other with push-ups, sit-ups, weight loss, jumping, treadmill, or swimming laps. Offer rewards that are tangible, and employees will be more motivated to participate in future fitness challenges. If you’re looking for more ways to implement fitness incentives or discover new wellness programs for employees, you can give us a call here at Wellworks For You at 800-425-4657.